Produced by Tristan Ong too! 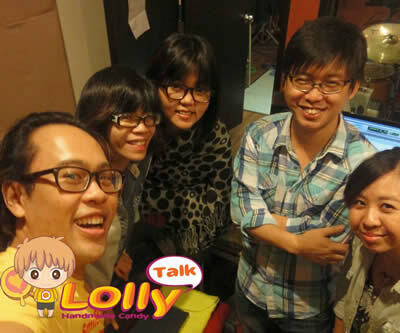 Co-ordinated and Co-produced by our very own LollyTalk Ambassador Joey Wee. 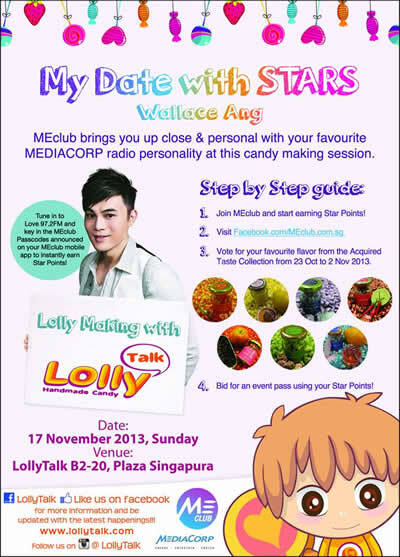 "Lolly Making with Wallace Ang" is one of the "Date with Stars" event of Mediacorp MEClub, in collaboration with LollyTalk. 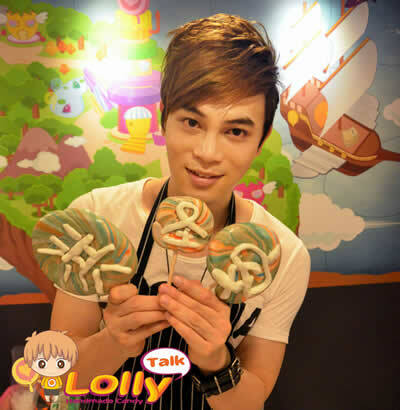 LollyTalk together with Mediacorp and MEclub gave Wallace's fans a chance to get up close and personal with him, making lolly at Plaza Singapura B2-20 on 17th November 2013!! 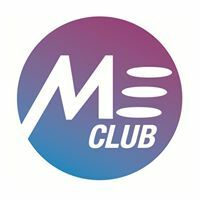 What makes the event even more memorable is the fact of Wallace first public appearance a day after winning the MediaCorpo Most Popular DJ personalitly of FM97.2!!! 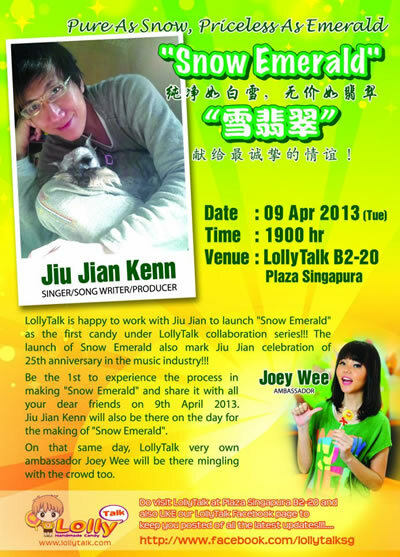 LollyTalk is happy to have Jiu Jian, Kenn with us on 9th April 2013, together we launched the "Snow Emerald" Collaboation Lolly. It was a fun-filled day with friends and fans crowding the shop watching the making of the candy. The launch of Snow Emerald also mark Jiu Jian celebration of 25th anniversary in the music industry!!! 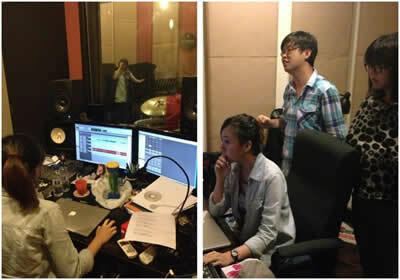 LollyTalk is proud to work with Filmotion and local Indie Singer Bevlyn Khoo in the production of the Music Video for "哈哈歌“ (Ha Ha Song). 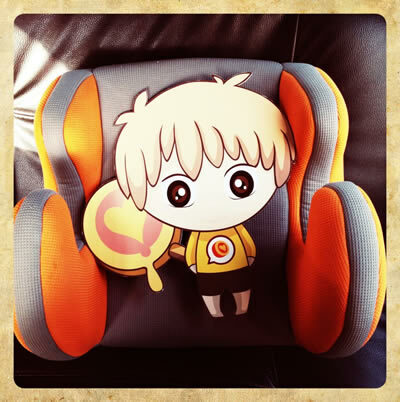 LollyTalk's adorable mascot ROCKY and CANDY are being featured in the MV too!!!! Was a wonderful day with kids from Angel Care Centre visiting LollyTalk as their school exercusion!!! 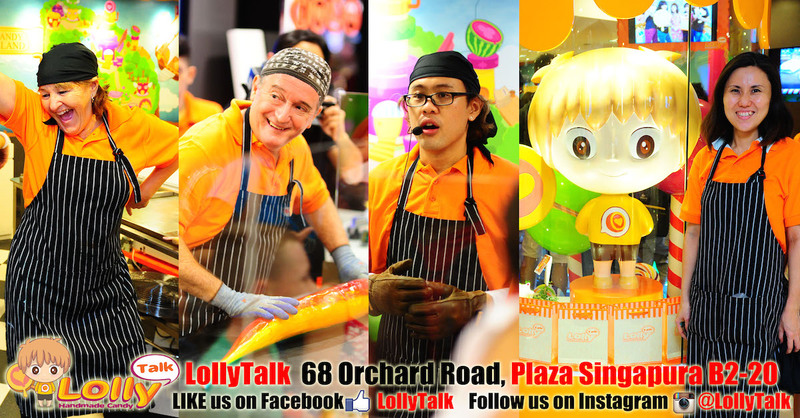 The kids had as much fun as the Lolly Chefs making the Orange Lolly right in front of them!!! It was so excited to see the kids enjoying themselves and enjoying their orange lolly!! 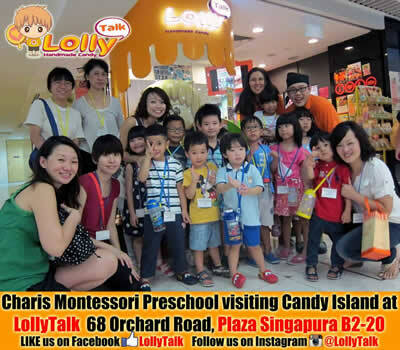 Charis Montessori Preschool, pre-schooler excursion to LollyTalk to understand more about candy making while having a hands on session being our little-lolly-chef for the day! 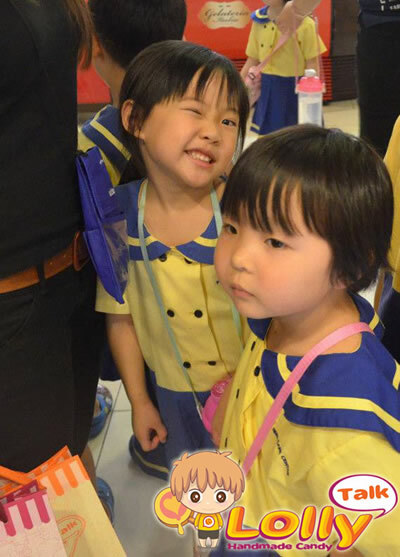 This is part of Charis Montessori June Holiday Programme with the theme of 'Sweet treats with great friends', where the kids are introduced different types of sweet treats and their origins. Everyone at LollyTalk had a very fun morning, with the kids enjoying themselves so much, watching us making, as well as getting their hands on in the making of the lollies. The kids brought back all the lollies & lollypops they made themselves in a goodie bag!